One of these things is not like the others, or so the song goes. In this case, the outlier is the first Panettone, the only orthographically correct version of the subject of this post. To tell the truth, the two imposters share the spotlight only by way of capitulation to less-than-forgiving search engines (and not as a sly reference to the 90s R&B/soul group) because it is my mission to ensure that everyone falls in love with this gift to the culinary arts as deeply, passionately, and yes, obsessively as I have. You’re all familiar with panettone, right? That Italian (Milanese, specifically) sweet, fruity, fluffy cake that’s usually consumed for the holidays (Christmas, specifically) but can be enjoyed year-round by ardent aficionados (me, specifically). • Pandolce, “sweet bread”, hails from Genoa, and unlike gossamer panettone is dense and somewhat crumbly like a cookie. • Panforte, “strong bread”, is neither breadlike nor cakey; it’s more of a dense, chewy fruit paste, spicy and sweet. I sometimes serve it as an accompaniment to a cheese plate. • Panpepato, “peppered bread”, is a subset of panforte, gingery, nutty, and covered with chocolate. • Pangiallo, “yellow bread”, is Rome’s challenger. Sometimes saffron infused, often laden with chocolate and always dense with dried fruit, I know this one only by repute. Now that we’ve dispelled any confusion regarding the distant cugini, we can focus on the object of our affection. Our goal is to determine which style and brand you like the best. We’ll start with style; the two you’re most likely to encounter are panettone, the pride of Milan and pandoro, Verona’s answer to it. The story of how panettone gets its name is the stuff of which legend is made but I frankly don’t find any of the fables particularly convincing. One tale recounts that in 15th century Milan, a delicious bread was crafted that incorporated yeast, an ingredient so dear in that era that it earned the moniker “pane di tono”, literally “luxury cake” – feasible, except that every Italian dictionary I own or found on the interwebs fails to suggest “luxury” as a definition for tono. But I suppose Italian was different back then. Another more linguistically stringent contender avers that since pane means bread or cake, adding the diminutive suffix -etto turns it into a small loaf cake and then appending the augmentative suffix -one renders it large, thus describing a “large small loaf cake”. Really? But I suppose whimsy was different back then. Yet another narrative tells of the Duke of Milan’s cook who having prepared an otherwise sumptuous repast disastrously burned the dessert. Fortunately, the young kitchen apprentice, Toni, proposed that they serve the sweet cake he had made for his own breakfast. Delighted, the Duke requested the name of the delicious cake, the cook replied “il pane di Toni”, and the rest is history. I don’t know about you, but if I had concocted so splendid a treat for my breakfast, none would have been kicking around the kitchen come dinnertime – not to mention the fact that the preparation of panettone is a time consuming, arduous process and not something one hastily throws together for breakfast like a bagel with a schmear. But I suppose panettone was different back then. Less about folklore and more about traditional religious ritual, the people of Milan save a piece of their Christmas panettone, have it blessed and eat it on February 3, the morning after Candlemas which for them heralds the end of the Christmas season. Known as the Feast of San Biagio, it celebrates the saga of St. Blaise as he saved the life of a boy who was choking on a fish bone by feeding him bread in order to dislodge the bone. Eating panettone for breakfast that day therefore pays homage to the “protector of the throat”, patron saint of throats and noses, and ensures that his followers will be safeguarded against colds and sore throats in the upcoming year. 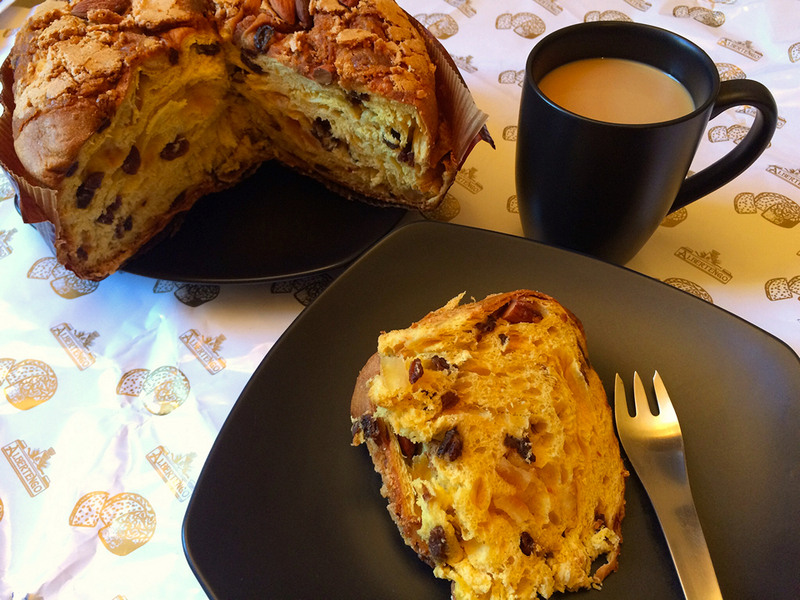 Who needs a flu shot when you have such a delicious excuse to enjoy more panettone? Enough history; what’s it like? The shape is that of a domed, squat cylinder, about 5–6 inches high, 8–9 inches in diameter, typically baked in a pan lined with a ring of corrugated, often brown, paper. Based on a sweet risen dough, it’s airy, eggy, buttery, moist and so light that it practically floats; it pulls apart almost like cotton candy although you’ll want to slice it with a serrated knife. The classic version is stippled with candied citron and raisins and often sports an almond or hazelnut glaze. Many other less traditional but still delicious flavors abound including pistachio, sour cherry, mixed berry, pineapple, peach, apricot, pear, bits of chocolate, moscato wine, limoncello, zuppa inglese, tiramisu, crema pasticcera (custard), and combinations thereof including varieties without candied fruit. I’ve seen numerous recipes with recommendations for what to do with leftover panettone. “Leftover panettone” is an oxymoron and bears no further discussion here. I will admit, albeit grudgingly, that you can freeze it, but only if it’s wrapped extremely well. Like so many cultural dichotomies such as Coke vs Pepsi, the Beatles vs the Stones, the Addams Family vs the Munsters, and Mary Ann vs Ginger, there are those who champion Verona’s pandoro (“golden bread”) over Milan’s panettone. The texture of pandoro is a little denser than that of panettone but not as dense as pound cake. Also sweet and buttery, touched with vanilla, they are customarily devoid of candied fruit or decadent chocolate and creamy fillings; on occasion, you might detect a delicate whisper of other flavorings like anisette or lemon zest. Picture a two-dimensional eight-pointed star, extruded upwards conically into three dimensions and taller than a panettone; it is often presented with nothing more than a sprinkling of powdered sugar to resemble the snow-covered Alps in winter. If you insist on inventing more complex dishes using “leftover” Italian Christmas breads, the more modest pandoro lends itself better than panettone to the addition of crème fraîche, mascarpone, whipped cream, custard and fresh fruits, or the likes of Nutella (since panettone is, after all, perfection straight out of its wrapper – in my not so humble opinion, of course 😉). Now on to brand. Like everything in the food world, it should always be about what you like personally and individually, not about what somebody tells you you should like. Each brand has its own flavor and texture, let alone unique varieties. Over the years I’ve eaten my way through mountains (think Alps) of these treats and I’ve found what I consider to be the very best: Albertengo brand Panettone Tradizionale Glassato (traditional glazed) – but they’re almost impossible to find in New York. So I wrote to the nice folks at Albertengo in Italy in buoyant English and foundering Italian and they turned me on to the one place in the city that stocks the stuff: Nicola’s Specialty Foods at 997 First Avenue in Manhattan. The photo at the top of the page shows this morning’s breakfast: Albertengo Tradizionale Glassato – la colazione dei campioni! I consider myself fortunate to be a regular attendee at the Specialty Food Association’s Fancy Food Show every year here in New York City. Featuring thousands of new products from the US and internationally, they’re considered North America’s hottest place to catch the latest in specialty foods. Needless to report, at the 2017 show, I spent a good deal of discerning time in Italy’s pavilion checking out the panettoni both for flavor and to determine where retail outlets will be. After all, when I find a winner, you need to know how to score some! This entry was posted in Out & About, Shopping, Stories, Sweets and tagged Holidays, Italian by Rich. Bookmark the permalink.